I have to admit – I couldn’t stop taking pictures of this Spiced Pork Roast. The late afternoon sun was glorious, the house smelled of roasted meat with an intermingling of spice and my mouth was watering with ideas of how many different recipes I could create with this simple roasted pork shoulder. I eventually stopped taking pictures since my kids were begging me to serve the meat straight off the bone for their afternoon snack. 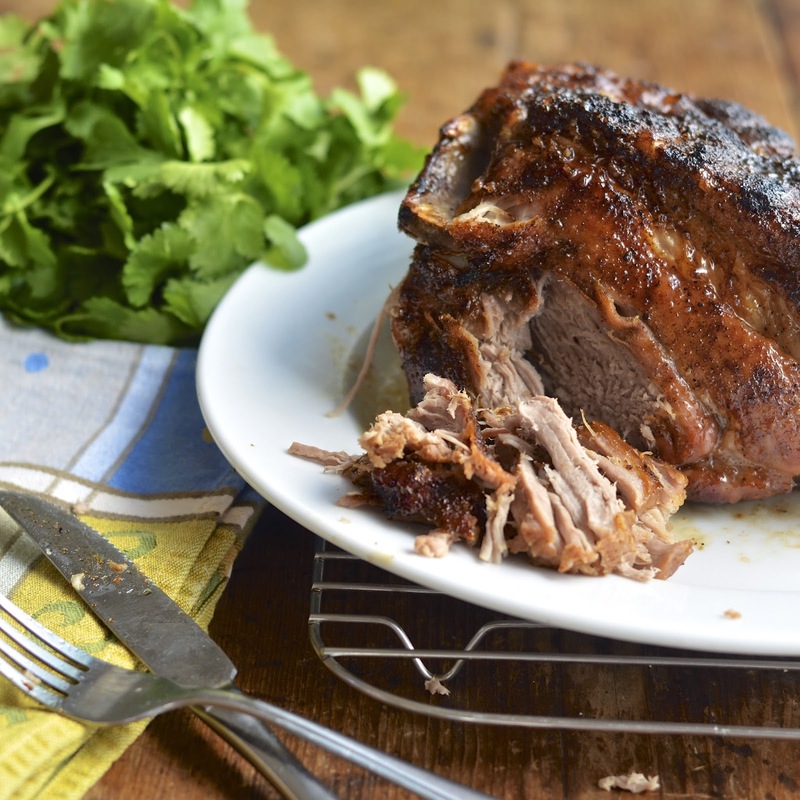 Can anyone really resist picking at a pork roast? My kids' itchy fingers couldn't! The key is getting a piece with the crispy, salty crust and the moist stringy meat and letting it all melt in your mouth with a symphony of flavors and textures. My family ate dinner at 5:00 that night. Our tummies were growling for this delicious bad boy! Truly, the possibilities are endless. We served up this pork with some mashed potatoes and sautéed rapini. Let’s just say there wasn’t much talking during dinner. We were all very busy concentrating on our meal. Staring at, editing and sharing these pictures now, are making me want to pop in another roast this week. All you need is a few hours at home because it is a slow, low heat baking process. Spice it up any way you like and add a bubbling caramelized brown sugar glaze at the end for a beautiful golden appearance and sweet crunchy crust. 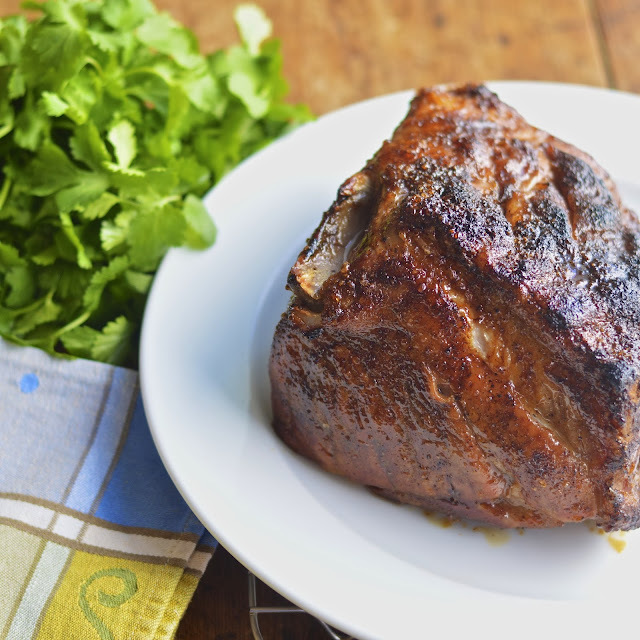 A happy family dinner is guaranteed with this spiced pork roast. In a small bowl combine salt, cumin, ancho chili and cayenne. Rub salt mixture all over the surface of the roast and place pork shoulder into a roasting pan, fat side up and . Bake for 4.5 - 5 hours or until an instant read meat thermometer reads 195 degrees (Baste very 1/2 to 1 hour with juices accumulated in the pan). In a small bowl mix brown sugar and vinegar until a thick glaze has formed. When roast has reached temperature, pull it from oven and spread glaze over the top and sides of roast. Increase oven temperature to 500 degrees F and bake until glaze is bubbling and browned (this should only take a few minutes, so continually watch to avoid burning). Hi Peter. Crusty roasted pork is delicious! Uncovered - that's how you get that crispy crust! Just be sure to baste it every now again.